I don’t often like to get into the ins and outs of my health online – number one, it’s pretty gross! Number two, it’s really quite personal; and I try to keep a bit of a line between my online and real life personas; but as part of Coeliac UK’s Gut Feeling Awareness week, they asked a number of bloggers to share their Coeliac diagnosis stories – so I wanted to support that in case anyone recognises my experience and this helps them get an answer to their health problems. If more women were willing to be a bit more ‘warts and all’ (or rather, ‘guts and all’) about their bodies, we’d catch a lot more medical problems earlier. I don’t think there’s a typical diagnosis story; and because my symptoms were somewhat atypical it meant that I had quite a long and bumpy ride to figuring out just what was going on with my health. For as long as I can remember I had classic mild coeliac or IBS-type symptoms. Constipation, occasional bloating, mild anaemia and low energy. But I, like many women, thought that’s just how everyone feels – that’s normal. I’d seen enough adverts on the TV for ‘dulcoease’ to believe that going to the loo (uncomfortably) every 3 or 4 days was just normal for women. Friends used to compare me to the character Nibbler from Futurama. Those symptoms continued, and slightly worsened, as I embarked on a career which involved a lot of international travel. I put it down to rich restaurant food and frequent flying (air travel mucks your digestion up, right? ), but the real turning point was a trip to Mexico in 2008 where I contracted a severe bout of gastroenteritis (or what I thought was food poisoning). In retrospect I don’t know if it was an illness which triggered the coeliac antibodies, or whether it was just coeliac coming to a head; but this was certainly the turning point in the decline of my health. It started with running out of meetings at work (between presenting) to be sick for a few days. From that point on I had regular bouts of diarrhoea alternating with constipation for several months. I put it down to a dodgy travellers tummy and followed the advice to stick to a simple diet of plain bread and pasta until it cleared up. I remember being locked in hotel bathroom, anxious about missing my taxi to the client office in Budapest. Visiting a doctor in Cyprus on holiday who said ‘what do you mean, you’ve had this for 3 weeks?’ before prescribing me rehydration salts. Things got a little better with my digestion, but that’s when the headaches started. A distinctive pain right at the front of my head. On bad days I would get spots in my vision. I had a headache constantly. I got sick of hearing myself complaining about it. the worst thing was that over the counter painkillers didn’t touch it. Workmates started saying ‘god, you look dreadful’ (thanks!). I finally relented and went to my GP. At first they prescribed some pretty strong codeine. I took the whole course – it barely worked and made me feel dreadfully sick and woozy. I followed advice to start a food diary but couldn’t find a pattern of what triggered the headaches. I tried cutting out wheat for a day or two (but carried on eating cous cous), and couldn’t see a correlation. Of course I couldn’t – I didn’t know where gluten lurked or that a few days wouldn’t be enough. I even went to see an acupuncturist. I am a massive sceptic of alternative health treatments, but funnily enough he was the only one who said “I think the headaches are related to your digestive system” before sticking needles in my spine. It didn’t help. The third time I went back to the GP, after negative scans and tests, they diagnosed me with stress and signed me off work for 6 weeks. Nothing improved; and we had already been planning to take a leave of absence travelling; so this seemed like the answer. 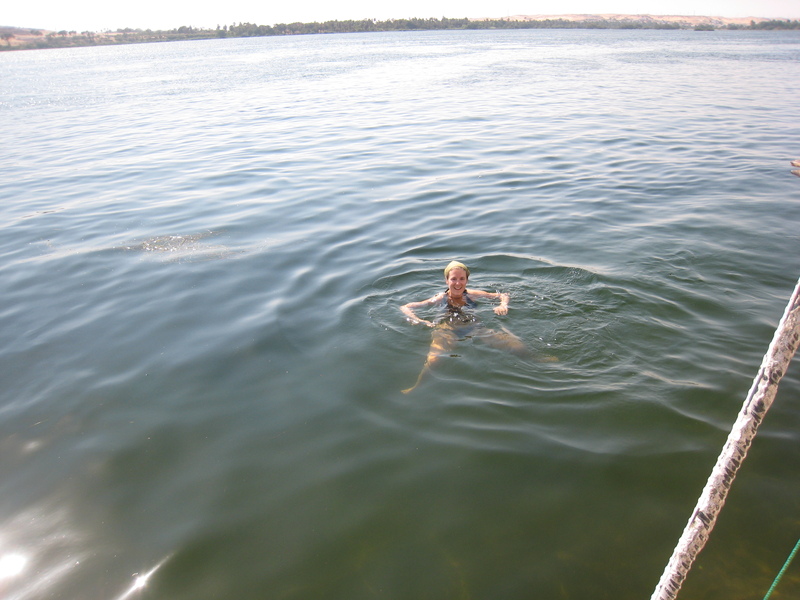 A quick dip in the Nile near the end of 3 months in the Middle East. No wonder I couldn’t tell what was upsetting my tummy! We had an amazing time overland trekking in the Middle East. Enjoying ourselves eating all the local delicacies – especially the lovely big Iranian flatbreads and Syrian pastries. I was again troubled with ‘travellers tummy’ mixed with days of constipation – but then so were lots of other people; and the headaches were a little better. It got significantly worse about half way through our trip, after a nasty bout of ‘food poisoning’ I was put on a drip in a hotel room in Turkey because I was so dehydrated, and instructed to eat nothing but plain bread and crackers until it cleared up. It eventually did, but I came down with horrid flu and was back to the constipation and headaches. By the end of the trip I had lost at least 1 stone in weight. On returning to the UK I went back to my GP – now 1 year since initially going after Mexico. They did all the usual tests for bugs and parasites I could have picked up in strange destinations. Nothing came back. I started to worry it was in my head – I was making a fuss about nothing. I returned for another appointment – it was a newly qualified GP. “It sounds like IBS”, she said “but according to the NICE guidelines I need to test to exclude coeliac disease first. I don’t think it’s that, but I have to exclude it.” She organised a blood test. As a fad-diet sceptic foodie, I never in my wildest imagination thought that when I phoned for the results I would get a “we think you need to come in to discuss them”. I was in the middle of a breakfast meeting, half way through a croissant. I felt abuzz with anxiety and elation at the same time – actually overwhelmingly relieved that they had found something – it wasn’t in my head, and I wasn’t going to get a ‘catch all’ diagnosis of IBS! I didn’t eat the rest of the croissant. Don’t leave it weeks and months before seeing a doctor! Don’t cut out gluten before you get the tests! From then on, unfortunately I suffered quite a lot of trial and error at the hands of health care practitioners who were not experienced with coeliac disease. On the basis of the ‘strong positive’ blood test for the coeliac antibodies I was advised to immediately cut out gluten (incorrect) “then in the future you might find you can have a little bit” (incorrect). I did cut out gluten (at least, where I knew it was hidden), and after a few weeks started to notice a dramatic difference in my headaches. After a month or two my digestion had improved, and people started saying “you’re like a different person!” I had so much more energy and was happier. A little while later, I was getting occasional symptoms again – and couldn’t figure out where from. Thankfully I am an avid internetter, so quickly found the Coeliac UK site, and was able to download the diagnosis guidelines, and went back to the GP to ask for a referral to a gastroenterologist for the ‘gold standard’ biopsy test. Unfortunately, as I had been (as far as I knew) gluten-free for several months, getting an endoscopy would require eating gluten again. Again I suffered at the hands of an inexperienced doctor. He told me to eat “a little bit of bread for 2 weeks” first (it’s supposed to be at least 6 weeks). He also “assumed it was a clear cut case” – the reaction I got from the return to gluten was so distinct – so he only took one sample (it’s supposed to be several) which was subsequently damaged and couldn’t be read. The results were ‘inconclusive’. I was devastated. Had I changed my life around for no reason? Was I back to square one?! They attempted to salvage the biopsy sample, and repeated the blood tests (even though I was gluten-free again). This came back ‘suggestive’ of coeliac, and I was advised to continue my life on the basis of that diagnosis. Back to my GP who wouldn’t refer me to a dietician (because my gastroenterologist was seen on private health insurance), and wouldn’t prescribe me any gluten free products (“because you can get loads of stuff in Sainsbury’s now”). I felt confused and a little lost, but accepted it. I felt like I could manage on my own with the support of my family, and having had such a horrid experience being back on gluten had no doubts that it was the source of my problems. And that’s where the online coeliac community has come in to help. Along with the advice and resources from Coeliac UK, the numerous blogs, tweets and messages from other coeliacs online have helped me to manage the gluten-free life better than I otherwise could have done. 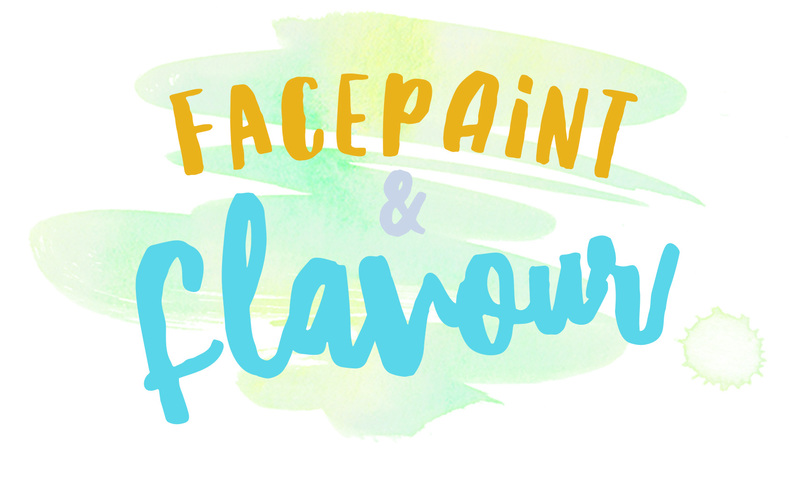 I’ve found out all sorts of mistakes I was making after diagnosis that could have been hampering my recovery (like using the same toaster or eating ‘may contain’ products), learnt to be more challenging and demanding of restaurants, and found loads of new products that make life easier. 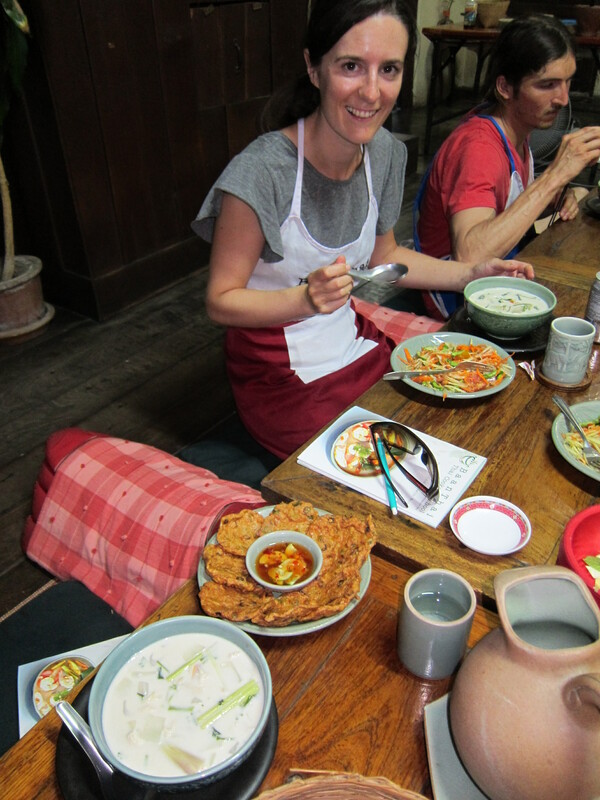 Luckily I have always been a keen cook, so have been enjoying exploring this new field and learning about nutrition; and adding my voice to the others online so that we can try to make life easier for those of us who need to avoid gluten. I’ve had to make some changes to my job – it was getting hard to stay safely gluten free with frequent, short notice travel. It’s important to talk to your employer so they can help you make adjustments. I’m still learning, I still make mistakes – but I’m very happy to have an answer, and family and friends (real life and virtual) who support me so well in managing to stay gluten free and healthy. The most surprising impact of all of this (as well as to my physical health) has been to my mental health. I’m happier and more content than I can ever remember being. So the moral is, listen to your gut (and for that matter, the rest of your body). If you know something is wrong, and these symptoms seem familiar, keep eating gluten and go ask your GP for a coeliac test. 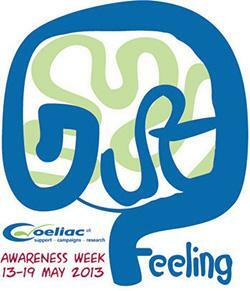 Look on the Coeliac UK website for more info. Follow up: a little piece on my ‘New Normal’ – life post diagnosis.